As humanity’s exposure to the risks of wildfire grows, communities should look to nature for strategies to survive and thrive in a more flammable world. 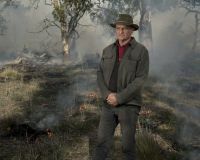 In a new paper published today in Nature Ecology and Evolution, the University of Tasmania’s Professor David Bowman, pictured, and the University of Idaho’s Professor Alistair Smith and Associate Professor Crystal Kolden argue that the keys to living sustainably with fire can be found in the wild. “Among natural systems, there are plants and animals that thrive with fire – pyrophilic species –, and there are some that can’t handle fire at all – pyrophobes; the fire-lovers and the fire-haters,” Professor Bowman said. “Modern communities and the habitats we build for ourselves – our cities and our houses – are pyrophobic and yet we keep putting them in flammable environments filled with fire-loving species. This is an approach that does not end well. This strategy, known as ‘biomimicry’, is already a foundation of science in other fields. Perhaps the most famous example of biomimicry is Velcro, the hook-and-loop binding material, which mimics the plant burs that cling to animal fur and clothing. “Too often, we hear that cutting down some trees and removing dead wood is the solution, but fires in grasslands and savannas, where there are few trees, show us that this won’t stop the bad fires,” Professor Smith said. The researchers highlight different types of species that successfully survive wildfires and give examples of how fire-mitigation traits developed by plants might be adopted by humans. For example, many species survive fires by moving critical resources underground or rely on fire to trigger germination through heat shock. Homes could adopt comparable traits such as protected water tanks, pumps and generators to feed exterior sprinkler systems. Scientists could further develop fire-resistant material, taking the next step towards coatings that harden or deploy retardant when exposed to heat. Wildfires are occurring more frequently, and they are becoming more destructive. The researchers argue for a move toward proactive investment in strategies to co-exist with fire, or we will continue in the current cycle of destruction and replacement. “We don’t need to reinvent the wheel; we just need to learn from natural systems,” Associate Professor Kolden said.